NASA – A Human Adventure is a thrilling journey through humankind’s exploration of space. Come face to face with NASA’s remarkable achievements in human space flights and space exploration – the greatest adventure that humans have ever undertaken.. Discover the exciting history of rocket science and space flight, and learn about some of the most extraordinary accomplishments in space technology. Within the Discovery Centre thousands of objects, animals and fossils are at your fingertips! You can observe and take part in a vast array of activities at different times of the year, whether it’s seeing our snakes and spiders being fed or helping sort through our stick insect frass to find their eggs. You can handle skulls, fossils, turtle shells, giant burrowing cockroaches or items from the First World War. Meet Museum experts and find out more about the role of curators, scientists, taxidermists and collection managers. Ask questions of specialist staff and bring objects in for identification and hear some extraordinary stories and facts with the Discovery Centre team having a special focus every day. Queensland Museum’s Anzac Legacy Gallery is a new permanent exhibition that explores the First World War and its legacies in Queensland. Using two key themes of Queensland at War and Queensland Remembers, the gallery uses a mixture of significant objects, authentic replicas and the latest 3D technology and animation to bring these evocative stories to life. At the heart of the gallery is an experiential encounter with one of Australia’s, and the world’s, most significant and dramatic war relics — the A7V Sturmpanzerwagen armoured assault vehicle, Mephisto. Ignite your imagination in SparkLab, our new Sciencentre experience where you’ll be free to follow your curiosity and bring out your inner scientist as you question, investigate and wonder about the world around you. This is a special International Star Wars Day themed event which will include Star Wars Origami – make your own X wing fighter, explore the scientific errors of Star Wards movies, talks on Star Wars Science and roving costumed characters. There will also be expert talks, live music, roving entertainment, Discovery Pop-ups and get up close to some wildlife. Can you design a spacecraft to hover above the surface of an alien world? Build and test your paper design in our flight tunnels that simulate the turbulence of a hostile planet. Explore the STEM principles around flight, design and engineering through hands on interaction with paper-based design. Visit theworkshops.qm.qld.gov.au for more information. Drawing on the extensive collections held by the Queensland Museum Network the exhibition investigates the ways Queensland Rail used photography, from documenting rolling stock to capturing spectacular scenery. It also tells the relatively unknown story of the Railway Appeal Board. This board was set up to pass judgments on matters where staff were charged with misconduct, as well as allowing staff to appeal against decisions they thought were unfair. Get building, engineering and inventing with one of the most popular activities ever hosted at the Museum. Children will enjoy an endless variety of play patterns including construction, pretend play, role-playing and creating their own games. Most importantly, they will be deeply engaged, active and have hours of fun! New! Little Nippers is the Museum’s playgroup for 2–6 year olds. Each Thursday from 9.45am learn through story, rhyme, dance, song and creative activities (excludes school holidays). Admission to the Museum is FREE for residents of the Toowoomba Regional Council region with proof of residency. When dinosaurs became extinct 65 million years ago, some fascinating animals did survive — many of them giants. These huge reptiles and marsupials, called ‘megafauna’, roamed the countryside right here on Queensland’s Darling Downs where their remains have been found at more than 50 sites. Go back to the Pleistocene epoch on the Downs, from 1.8 million to around 10,000 years ago, and take a look at some remains of these bizarre creatures. Discover your inner artisan at one of our renowned Hands on Workshops. Experience the satisfaction of learning a traditional skill and creating something beautiful and functional by hand. Classes are small to ensure you receive all the assistance you need to complete the project from our expert artisans. Plus you will enjoy delicious refreshments prepared in Cobb’s Coffee Shop. Choose your workshop and book online now or contact Cobb+Co Museum on 07 4659 4900. Thanks to the team at Geckoes Wildlife, Wildlife Rangers will let you get up close and personal to some of Australia’s favourite animals as we learn all about their day to day lives. Please note: 10.30am show best for ages 3-7, 12noon show best for ages 8-12, however all ages are welcome to attend either show. A new exhibition showcasing Queensland Museum Network’s vast specimen collection, past scientific discoveries and vital future research opens at Museum of Tropical Queensland on Saturday 6 April 2019. Natural Curiosity: Discovering the secrets of Queensland’s greatest collections is set to provide visitors with an insight into Queensland Museum’s biodiversity collections and why they play such an important role in preserving the natural world for future generations. 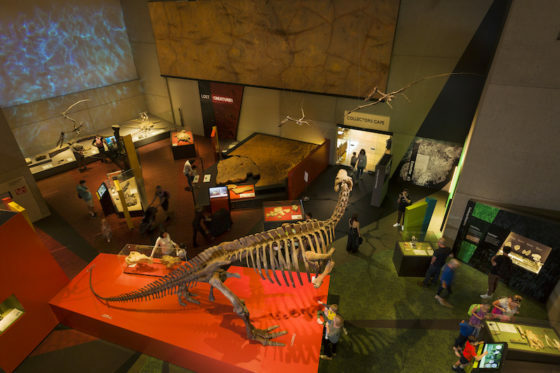 The exhibition will take visitors on a journey through the many research areas of the museum including our areas of expertise of marine, corals and palaeontology and showcases items from their iconic collections including animal skulls, preserved skeletons, study skins and fossilized bones, dinosaur tracks and teeth. Unleash your inner scientist the Museum of Tropical Queensland’s new permanent gallery, Sciencentre promises a discovery-zone with plenty of fun where people of all ages can get hands-on with more than 20 interactive exhibits and find out how science challenges the human body, exercises the brain and stimulates the senses. Kids can explore the world of science through play, follow their curiosity, ask questions, test ideas and use their imagination in this exciting, interactive and experience-rich environment. North Queensland is renowned for its sugar growing. This new community exhibition developed in conjunction with Herbert River Museum, Halifax celebrates history of sugar in the Ingham region from 1868 until the present day. This display take visitors through history, from when the first cane was planted and the establishment of sugar plantations, through labour force revolutions, development beyond World Wars, survival from natural predators and how it has become part of the billion dollar world-wide industry that it is today. HMS Pandora was the British Royal Navy warship dispatched to the South Pacific in pursuit of the infamous Bounty mutineers. Today, the mutiny on the Bounty remains one of the best-known stories in the history of seafaring. Few, however, know the epic story of the Pandora and the extraordinary efforts of the Royal Navy to recover the pirated Bounty and bring the mutineers to justice. Pandora remains as one of the most significant shipwrecks in the Southern Hemisphere. Visitors will be captivated by the story of the ill-fated Pandora and should allow at least an hour to enjoy this intriguing exhibition. The Museum of Tropical Queensland will come alive not only with the creepiest and crawliest, but the fun and the furry this Easter. Commencing Saturday 6 April, everyone is invited to get up close to some of Queensland’s creepiest and cutest creatures. Kids can join an expert to learn about (or even hold) some unique insects, participate in special creative activities and even have a munch on an edible bug or two! Live animal highlights include Australian animals shows with Ranger Dan from Hands on Wildlife from Monday 8 – Friday 12 April. There will also be sessions with Far North Queensland insect experts Mini Beasts Wildlife when they present the most weird and wonderful creepy crawlies on stage from Monday 15 April until Thursday 18 April. Families can work together to create creatures for the Insect Highway, and even paint their own pet ‘bug’ rocks to take home. The Museum is closed on Good Friday, but resumes regular operating hours over the Easter long weekend.